Swathed in the constricted mist of spirituality, experience the real meaning of Unity in Diversity and celebrate the gift called life by seeking blessing at Mata Vaishno Devi, Maha Kali and Thiksey Monastery. Sail on the sparkling waters of Dal Lake or stroll through the resplendent trails of multi-hued flowers at Mughal Garden. Take chances at easy to rigorous adventure activities like golfing, trout-fishing, trekking and mountaineering offered at different regions of the state. Savor the taste of mouth-watering Kashmiri cuisine and cherish the fantastic hospitality offered by sundry hotels & resorts. 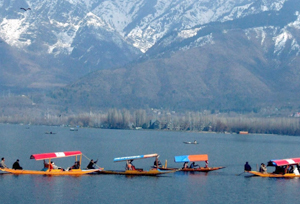 The vast exploratory resources, ample of adventure options along with abundance of cultural treasure make holidays in Jammu & Kashmir the most remarkable sojourn.